We present a finger-mounted quantitative micro-elastography (QME) probe, capable of measuring the elasticity of biological tissue in a format that avails of the dexterity of the human finger. Finger-mounted QME represents the first demonstration of a wearable elastography probe. The approach realizes optical coherence tomography-based elastography by focusing the optical beam into the sample via a single-mode fiber that is fused to a length of graded-index fiber. The fiber is rigidly affixed to a 3D-printed thimble that is mounted on the finger. Analogous to manual palpation, the probe compresses the tissue through the force exerted by the finger. The resulting deformation is measured using optical coherence tomography. Elasticity is estimated as the ratio of local stress at the sample surface, measured using a compliant layer, to the local strain in the sample. We describe the probe fabrication method and the signal processing developed to achieve accurate elasticity measurements in the presence of motion artifact. We demonstrate the probe’s performance in motion-mode scans performed on homogeneous, bi-layer and inclusion phantoms and its ability to measure a thermally-induced increase in elasticity in ex vivo muscle tissue. In addition, we demonstrate the ability to acquire 2D images with the finger-mounted probe where lateral scanning is achieved by swiping the probe across the sample surface. R. H. Wilkins, “Neurosurgical Classic—XVII,” J. Neurosurg. 21, 240–244 (1964). J. K. Harness, A. E. Giuliano, B. A. Pockaj, and E. Downs-Kelly, “Margins: a status report from the Annual Meeting of the American Society of Breast Surgeons,” Ann. Surg. Oncol. 21(10), 3192–3197 (2014). D. Field and J. S. O. Hutchinson, Field’s Anatomy, Palpation, and Surface Markings (Elsevier Health Sciences, 2006). R. G. Pleijhuis, M. Graafland, J. de Vries, J. Bart, J. S. de Jong, and G. M. van Dam, “Obtaining adequate surgical margins in breast-conserving therapy for patients with early-stage breast cancer: current modalities and future directions,” Ann. Surg. Oncol. 16(10), 2717–2730 (2009). K. J. Parker, M. M. Doyley, and D. J. Rubens, “Imaging the elastic properties of tissue: the 20 year perspective,” Phys. Med. Biol. 56(1), R1–R29 (2011). J. Ophir, I. Céspedes, H. Ponnekanti, Y. Yazdi, and X. Li, “Elastography: a quantitative method for imaging the elasticity of biological tissues,” Ultrason. Imaging 13(2), 111–134 (1991). A. P. Sarvazyan, O. V. Rudenko, S. D. Swanson, J. B. Fowlkes, and S. Y. Emelianov, “Shear wave elasticity imaging: a new ultrasonic technology of medical diagnostics,” Ultrasound Med. Biol. 24(9), 1419–1435 (1998). L. Castera, X. Forns, and A. Alberti, “Non-invasive evaluation of liver fibrosis using transient elastography,” J. Hepatol. 48(5), 835–847 (2008). M. Yin, J. A. Talwalkar, K. J. Glaser, A. Manduca, R. C. Grimm, P. J. Rossman, J. L. Fidler, and R. L. Ehman, “Assessment of hepatic fibrosis with magnetic resonance elastography,” Clin. Gastroenterol. Hepatol. 5(10), 1207–1213 (2007). A. Evans, P. Whelehan, K. Thomson, D. McLean, K. Brauer, C. Purdie, L. Jordan, L. Baker, and A. Thompson, “Quantitative shear wave ultrasound elastography: initial experience in solid breast masses,” Breast Cancer Res. 12(6), R104 (2010). B. F. Kennedy, P. Wijesinghe, and D. D. Sampson, “The emergence of optical elastography in biomedicine,” Nat. Photonics 11(4), 215–221 (2017). R. K. Wang, S. Kirkpatrick, and M. Hinds, “Phase-sensitive optical coherence elastography for mapping tissue microstrains in real time,” Appl. Phys. Lett. 90(16), 164105 (2007). A. Nahas, M. Bauer, S. Roux, and A. C. Boccara, “3D static elastography at the micrometer scale using Full Field OCT,” Biomed. Opt. Express 4(10), 2138–2149 (2013). S. Wang and K. V. Larin, “Shear wave imaging optical coherence tomography (SWI-OCT) for ocular tissue biomechanics,” Opt. Lett. 39(1), 41–44 (2014). J. A. Mulligan, G. R. Untracht, S. N. Chandrasekaran, C. N. Brown, and S. G. Adie, “Emerging approaches for high-resolution imaging of tissue biomechanics with optical coherence elastography,” IEEE J. Sel. Top. Quant. 22(3), 246–265 (2016). V. Y. Zaitsev, L. A. Matveev, A. L. Matveyev, G. V. Gelikonov, and V. M. Gelikonov, “Elastographic mapping in optical coherence tomography using an unconventional approach based on correlation stability,” J. Biomed. Opt. 19(2), 021107 (2013). S. Wang and K. V. Larin, “Optical coherence elastography for tissue characterization: a review,” J. Biophotonics 8(4), 279–302 (2015). 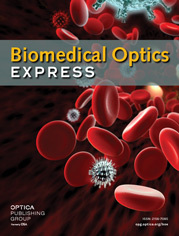 M. A. Kirby, I. Pelivanov, S. Song, Ł. Ambrozinski, S. J. Yoon, L. Gao, D. Li, T. T. Shen, R. K. Wang, and M. O’Donnell, “Optical coherence elastography in ophthalmology,” J. Biomed. Opt. 22(12), 1–28 (2017). S. Wang, M. Singh, T. T. Tran, J. Leach, S. R. Aglyamov, I. V. Larina, J. F. Martin, and K. V. Larin, “Biomechanical assessment of myocardial infarction using optical coherence elastography,” Biomed. Opt. Express 9(2), 728–742 (2018). B. F. Kennedy, R. A. McLaughlin, K. M. Kennedy, L. Chin, P. Wijesinghe, A. Curatolo, A. Tien, M. Ronald, B. Latham, C. M. Saunders, and D. D. Sampson, “Investigation of optical coherence microelastography as a method to visualize cancers in human breast tissue,” Cancer Res. 75(16), 3236–3245 (2015). C. Li, G. Guan, Y. Ling, Y.-T. Hsu, S. Song, J. T.-J. Huang, S. Lang, R. K. Wang, Z. Huang, and G. Nabi, “Detection and characterisation of biopsy tissue using quantitative optical coherence elastography (OCE) in men with suspected prostate cancer,” Cancer Lett. 357(1), 121–128 (2015). K. M. Kennedy, B. F. Kennedy, R. A. McLaughlin, and D. D. Sampson, “Needle optical coherence elastography for tissue boundary detection,” Opt. Lett. 37(12), 2310–2312 (2012). G. van Soest, F. Mastik, N. de Jong, and A. F. W. van der Steen, “Robust intravascular optical coherence elastography by line correlations,” Phys. Med. Biol. 52(9), 2445–2458 (2007). Q. Fang, A. Curatolo, P. Wijesinghe, Y. L. Yeow, J. Hamzah, P. B. Noble, K. Karnowski, D. D. Sampson, R. Ganss, J. K. Kim, W. M. Lee, and B. F. Kennedy, “Ultrahigh-resolution optical coherence elastography through a micro-endoscope: towards in vivo imaging of cellular-scale mechanics,” Biomed. Opt. Express 8(11), 5127–5138 (2017). K. M. Kennedy, C. Ford, B. F. Kennedy, M. B. Bush, and D. D. Sampson, “Analysis of mechanical contrast in optical coherence elastography,” J. Biomed. Opt. 18(12), 121508 (2013). X. Liu, F. Zaki, and Y. Wang, “Quantitative optical coherence elastography for robust stiffness assessment,” Appl. Sci. (Basel) 8(8), 1255 (2018). A. A. Sovetsky, A. L. Matveyev, L. A. Matveev, D. V. Shabanov, and V. Y. Zaitsev, “Manually-operated compressional optical coherence elastography with effective aperiodic averaging: demonstrations for corneal and cartilaginous tissues,” Laser Phys. Lett. 15(8), 085602 (2018). K. M. Kennedy, L. Chin, R. A. McLaughlin, B. Latham, C. M. Saunders, D. D. Sampson, and B. F. Kennedy, “Quantitative micro-elastography: imaging of tissue elasticity using compression optical coherence elastography,” Sci. Rep. 5(1), 15538 (2015). W. M. Allen, K. M. Kennedy, Q. Fang, L. Chin, A. Curatolo, L. Watts, R. Zilkens, S. L. Chin, B. F. Dessauvagie, B. Latham, C. M. Saunders, and B. F. Kennedy, “Wide-field quantitative micro-elastography of human breast tissue,” Biomed. Opt. Express 9(3), 1082–1096 (2018). G. Lamouche, B. F. Kennedy, K. M. Kennedy, C.-E. Bisaillon, A. Curatolo, G. Campbell, V. Pazos, and D. D. Sampson, “Review of tissue simulating phantoms with controllable optical, mechanical and structural properties for use in optical coherence tomography,” Biomed. Opt. Express 3(6), 1381–1398 (2012). K. M. Kennedy, S. Es’haghian, L. Chin, R. A. McLaughlin, D. D. Sampson, and B. F. Kennedy, “Optical palpation: optical coherence tomography-based tactile imaging using a compliant sensor,” Opt. Lett. 39(10), 3014–3017 (2014). B. F. Kennedy, S. H. Koh, R. A. McLaughlin, K. M. Kennedy, P. R. T. Munro, and D. D. Sampson, “Strain estimation in phase-sensitive optical coherence elastography,” Biomed. Opt. Express 3(8), 1865–1879 (2012). E. Tornberg, “Effects of heat on meat proteins - Implications on structure and quality of meat products,” Meat Sci. 70(3), 493–508 (2005). G. J. Lewis and P. P. Purslow, “The strength and stiffness of perimysial connective tissue isolated from cooked beef muscle,” Meat Sci. 26(4), 255–269 (1989). K. Li, R. Nataraj, T. L. Marquardt, and Z.-M. Li, “Directional coordination of thumb and finger forces during precision pinch,” PLoS One 8(11), e79400 (2013). P. Wijesinghe, L. Chin, and B. F. Kennedy, “Strain tensor imaging in compression optical coherence elastography,” IEEE J. Sel. Top. Quant. 25(1), (2019). T. A. Krouskop, T. M. Wheeler, F. Kallel, B. S. Garra, and T. Hall, “Elastic Moduli of Breast and Prostate Tissues under Compression,” Ultrason. Imaging 20(4), 260–274 (1998). L. Castéra, J. Vergniol, J. Foucher, B. Le Bail, E. Chanteloup, M. Haaser, M. Darriet, P. Couzigou, and V. De Lédinghen, “Prospective comparison of transient elastography, Fibrotest, APRI, and liver biopsy for the assessment of fibrosis in chronic hepatitis C,” Gastroenterology 128(2), 343–350 (2005). P. Wijesinghe, D. D. Sampson, and B. F. Kennedy, “Computational optical palpation: a finite-element approach to micro-scale tactile imaging using a compliant sensor,” J. R. Soc. Interface 14(128), 20160878 (2017). C. D. Lu, M. F. Kraus, B. Potsaid, J. J. Liu, W. Choi, V. Jayaraman, A. E. Cable, J. Hornegger, J. S. Duker, and J. G. Fujimoto, “Handheld ultrahigh speed swept source optical coherence tomography instrument using a MEMS scanning mirror,” Biomed. Opt. Express 5(1), 293–311 (2014). K. H. Kim, B. H. Park, G. N. Maguluri, T. W. Lee, F. J. Rogomentich, M. G. Bancu, B. E. Bouma, J. F. de Boer, and J. J. Bernstein, “Two-axis magnetically-driven MEMS scanning catheter for endoscopic high-speed optical coherence tomography,” Opt. Express 15(26), 18130–18140 (2007). P. H. Tran, D. S. Mukai, M. Brenner, and Z. Chen, “In vivo endoscopic optical coherence tomography by use of a rotational microelectromechanical system probe,” Opt. Lett. 29(11), 1236–1238 (2004). Y. Pan, H. Xie, and G. K. Fedder, “Endoscopic optical coherence tomography based on a microelectromechanical mirror,” Opt. Lett. 26(24), 1966–1968 (2001). B. Y. Yeo, R. A. McLaughlin, R. W. Kirk, and D. D. Sampson, “Enabling freehand lateral scanning of optical coherence tomography needle probes with a magnetic tracking system,” Biomed. Opt. Express 3(7), 1565–1578 (2012). N. Uribe-Patarroyo and B. E. Bouma, “Rotational distortion correction in endoscopic optical coherence tomography based on speckle decorrelation,” Opt. Lett. 40(23), 5518–5521 (2015). C. E. DeSantis, C. C. Lin, A. B. Mariotto, R. L. Siegel, K. D. Stein, J. L. Kramer, R. Alteri, A. S. Robbins, and A. Jemal, “Cancer treatment and survivorship statistics, 2014,” CA Cancer J. Clin. 64(4), 252–271 (2014). S. E. Singletary, “Surgical margins in patients with early-stage breast cancer treated with breast conservation therapy,” Am. J. Surg. 184(5), 383–393 (2002). H. Ballal, D. B. Taylor, A. G. Bourke, B. Latham, and C. M. Saunders, “Predictors of re-excision in wire-guided wide local excision for early breast cancer: a Western Australian multi-centre experience,” ANZ J. Surg. 85(7-8), 540–545 (2015). J. A. Knol, C. S. Marn, I. R. Francis, J. M. Rubin, J. Bromberg, and A. E. Chang, “Comparisons of dynamic infusion and delayed computed tomography, intraoperative ultrasound, and palpation in the diagnosis of liver metastases,” Am. J. Surg. 165(1), 81–87 (1993). T. C. Böttger, W. Weber, J. Beyer, and T. Junginger, “Value of tumor localization in patients with insulinoma,” World J. Surg. 14(1), 107–112 (1990). S. J. Wilson, D. Sellu, A. Uy, and M. A. Jaffer, “Subjective effects of double gloves on surgical performance,” Ann. R. Coll. Surg. Engl. 78(1), 20–22 (1996). Fig. 1 Finger-mounted QME probe (a) photograph, (b) schematic with inset showing the fiber probe and optical adhesive. (c) Beam profile of Probe 2 compared to an ideal Gaussian beam. Fig. 2 (a) OCT M-mode, (b) axial displacement, and (c) tangent modulus maps plotted over time. In (b) and (c), the compliant layer (CL) is masked in black. (d) Stress-strain curve of the compliant layer material and (e) tangent modulus plot measured with increasing stress in a phantom, evaluated from tangent modulus map shown in (c). Fig. 3 (a) Block diagram representation of the filtering scheme used to reduce hand motion artifacts. (b) M-mode scan illustrating discarded A-scans in cyan. (c) The filtered OCT image. Fig. 4 Mean tangent moduli measured in five homogeneous phantoms of varying elasticity (blue dots) compared to expected values measured with uniaxial compression (red line). The error bars show one standard deviation. Fig. 5 Finger-mounted QME on a bi-layer phantom. (a) M-mode OCT image showing the compliant layer (CL), soft layer (Layer 1) and stiff layer (Layer 2) and (b) OCT SNR with depth averaged over 50 A-scans, where the green diamond indicates the upper layer boundary and the yellow triangle indicates the lower. (c) Corresponding elastogram with ROIs overlaid (CL masked in black) and (d) tangent modulus vs depth with diamond and triangles representing the same boundaries as in (b). Both (b) and (d) were taken over the A-scan corresponding with the red lines in (a) and (c). (e) Measured tangent moduli of Layer 1 (blue) and Layer 2 (orange) layers plotted on the same axes as the respective expected measurements, acquired through uniaxial compression. Fig. 6 OCT M-mode scans of (a) raw kangaroo muscle and (b) the same region of tissue after being cooked for four minutes. The elastograms of (c) the raw and (d) the cooked muscle with ROIs represented by dotted lines (CL masked in black). (e) Tangent modulus measurements for the ROIs in the cooked and raw sample. Fig. 7 (a) 2D-OCT scan over a stiff silicone inclusion embedded within a soft silicone bulk and (b) the corresponding 2D elasticity map with the x-axis given in seconds (CL masked in black).